We are looking forward to another fantastic Triathlon/5K Walk & Run/Kids Triathlon this coming Memorial Day weekend, and we want to invite you to REGISTER NOW!!! The 13th Annual 2019 Fountain Valley Triathlon/5K Walk & Run will be held on Saturday, May 25, 2019. As in previous years, this is a great event for the entire family with a fun Adult Triathlon course, our 5K Walk/Run and FOUR categories for the kid triathlons! 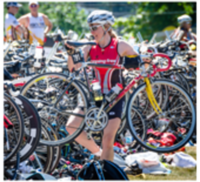 It is especially great for first time triathletes and 5K runners, although this event is a favorite for seasoned racers as well. Remember, all proceeds go to support Boy Scout Troop 297 and youth summer camps. Register by MARCH 31st to get the early-bird registration discount! Prices increase April 1, 2019. Shirt size is not guaranteed for registrations after May 8th. Please check the website above for ALL ROUTES. Maps are now available. All legs of the Kid Triathlons will be at Fountain Valley High School. Check website for details. Course maps have been posted. Packet pickup will be on Friday evening (5/24/19) at the Fountain Valley LDS Building from 5pm-8pm.